eraPower’s Accounting & Business Intelligence modules are the product of more than 40 years of innovation for the automotive dealer. Pentana Solutions knows it’s not the basics that attract financial controllers and that’s why we don’t offer a simple out of the box solution that could be used by any business. Reconciliation, return on investment and product flexibility are the areas Pentana Solutions customers focus on so eraPower’s Accounting module responds to these issues. Pentana Solutions understands that parts are a key focus so with just a few clicks financial controllers can reconcile a full parts inventory to the general ledger the first day of every month. eraPower Accounting also accurately calculates unapplied time and work in progress within the service department helping Financial Controllers realise dealership wide return on investment goals. In line with the multi-franchise dealership environment that exists in today’s Australian market the accounting module caters for multi company, branch, franchise and department via a neat chart of accounts. These are just some of the elements Pentana Solutions eraPower Accounting offers today’s Automotive Dealers. Although eraPower Accounting Module offers flexibility in reports the addition of Executive allows Financial Controllers to spend less time building reports and more time analysing the data within them. A neat slice and dice approach permits multiple views of the information so at any one point dealership data can be viewed by sales person, car line or vehicle sales type. Data can be served in a live set as a snapshot or as a trend over a number of months. This gives any dealership manager the ability to benchmark their business performance against manufacturer data or other preferred datasets making performance against business targets immediately clearer. The benefit of this business intelligence tool over others lies in its close relationship with your preferred DMS of choice – any innovation performed in the ERP flows through to Executive. 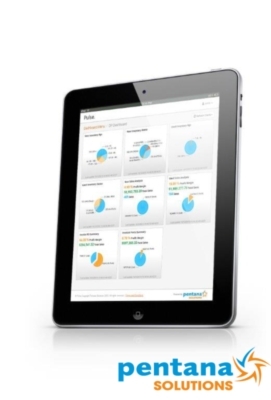 Pentana Solutions also offers another business intelligence tool for Financial Controllers & Dealer Principals who prefer the option of using a tablet or mobile – Pulse. This application serves data into a number of tiles, each of which is designed with a particular user in mind. This sleek, simple tool outlines issues across the dealership head on whilst also providing an easy way to monitor and manage user credentials and limits. All in all, Pentana Solutions offers Accounting and Business Intelligence products for today’s Automotive Dealerships. We’re committed to providing Financial Controllers information the way they want, so they can access the numbers exactly when they want it. Click to register for Pulse now! How would your dealership look in a snapshot?